I love baguettes. 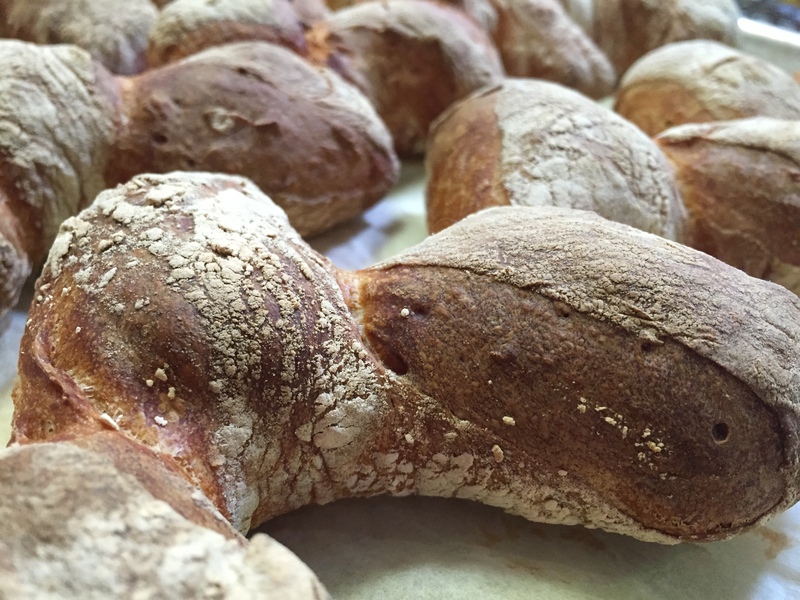 For me, they are the epitome of bread, and Pain de Epi is just another variation, and perhaps the most visually appealing, of the famous French loaf family. 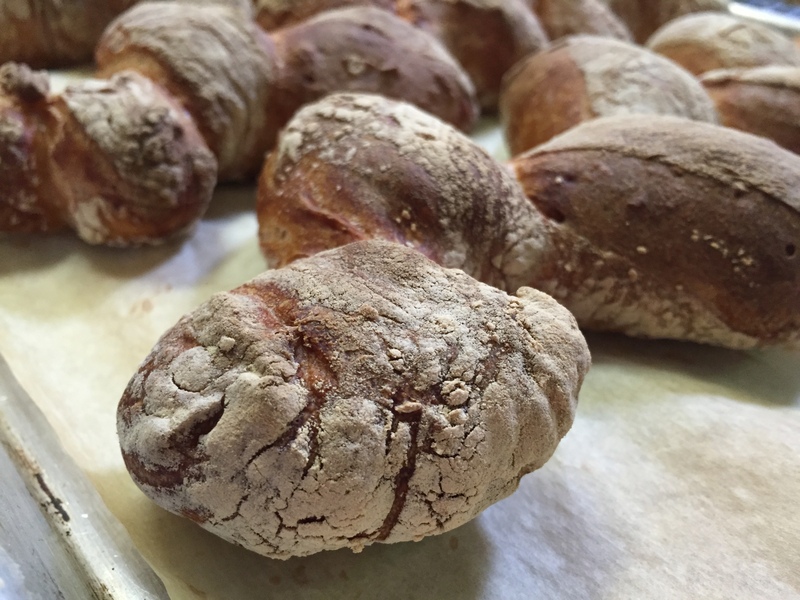 Its shape resembles an ear of grain, thus the name “wheat stalk bread,” and you can just place it in the middle of the dining table for everyone to tear a piece while they gather for supper. No serving plates necessary. It’s so romantically rustic. 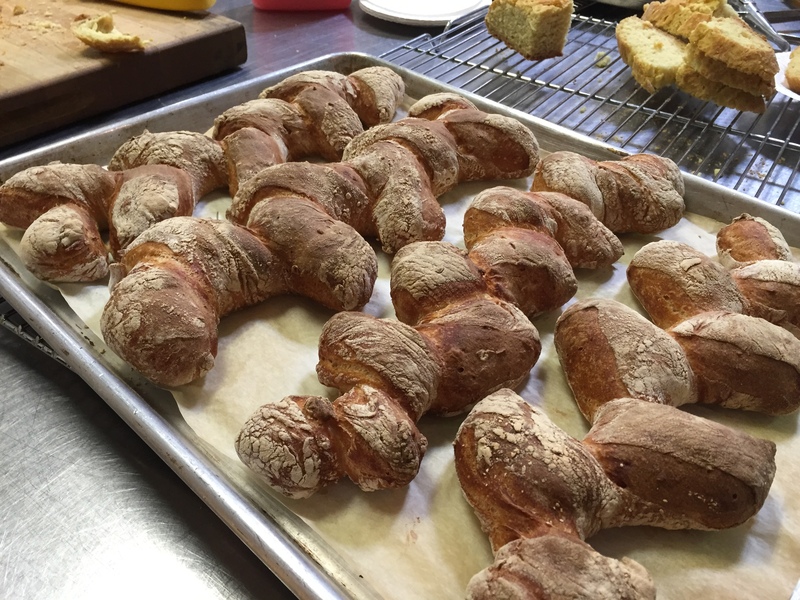 Needless to say, I was most excited to bake this crusty bread during the two-day bread-making workshop at Surfas Culinary District in Culver City. 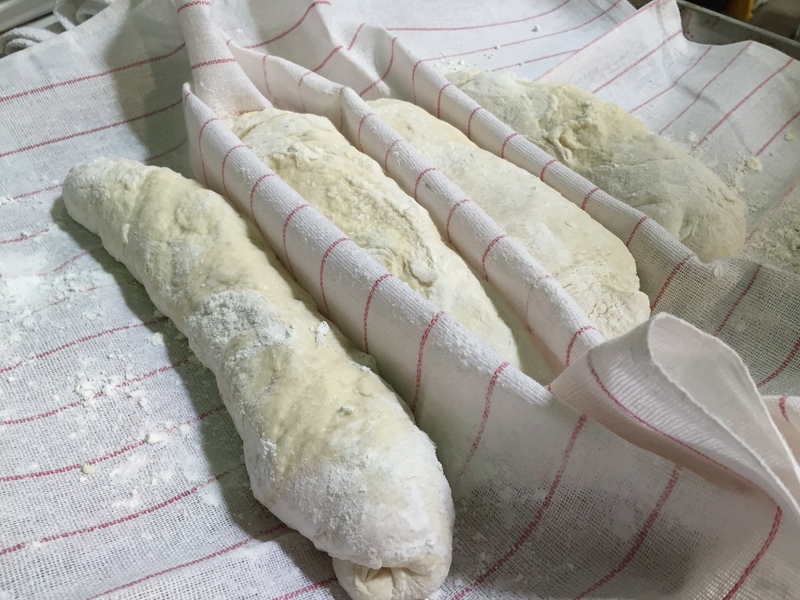 Making a Pain de Epi can be a two-day process because you need poolish that needs to be set aside overnight. 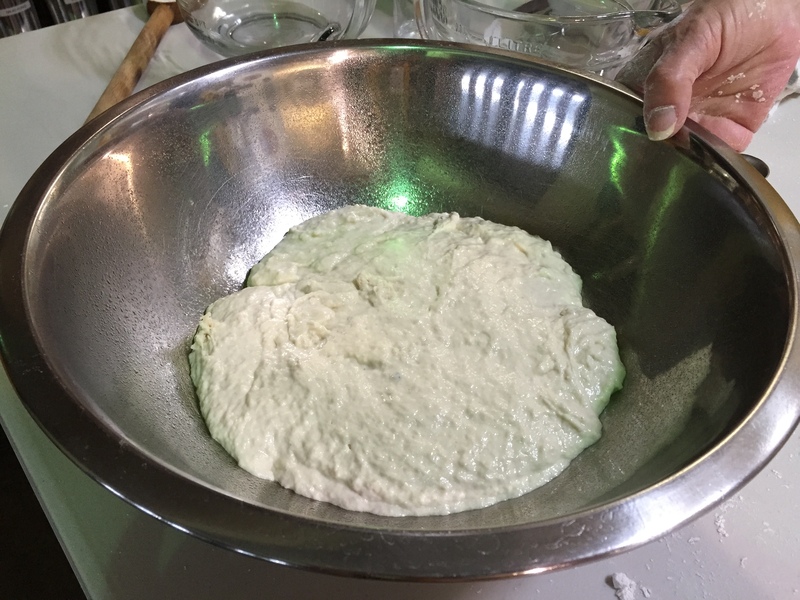 Poolish is the French version of its Italian cousin, biga (or also goes by other names like starter and sponge), a fermented starter made out of flour, water, and yeast. Lucky for us, Chef John had already prepared poolish for us so we were able to go through the entire baking process in less than three hours. 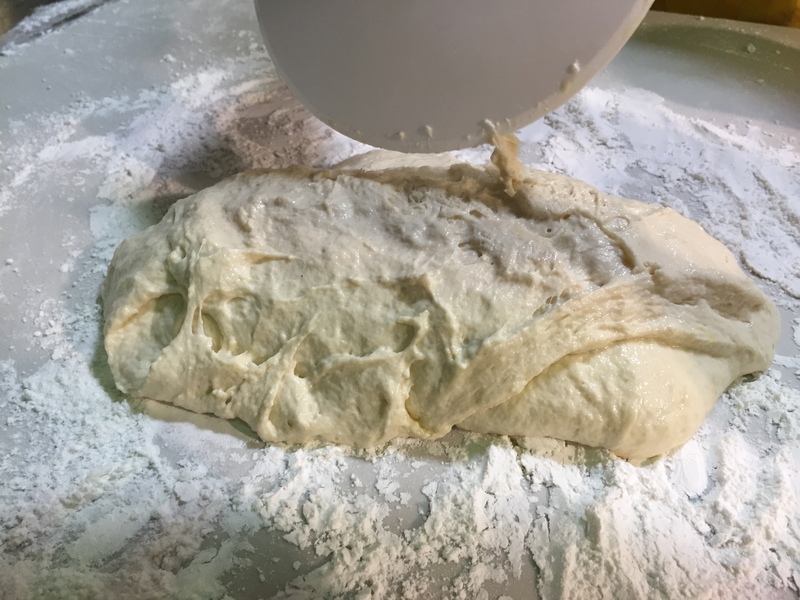 To begin, mix bread flour, warm water, yeast, salt, and poolish in a stand mixer fitted with a dough hook for 3-4 minutes in low speed, and speed it up to medium speed for another 2-3 minutes. Let the dough rest in a greased bowl, wrapped in plastic, for 45 minutes. Two things I learned during this process is that: 1. Don’t mix salt with the yeast, as it can kill the bacteria, and 2. It takes about six minutes for the mixture to develop gluten. 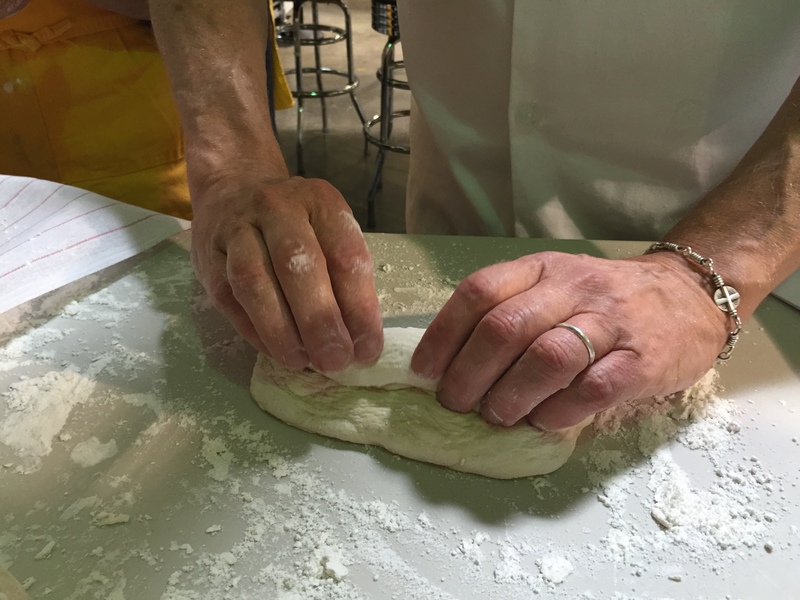 Remove the dough from the bowl and turn the dough onto a floured surface. 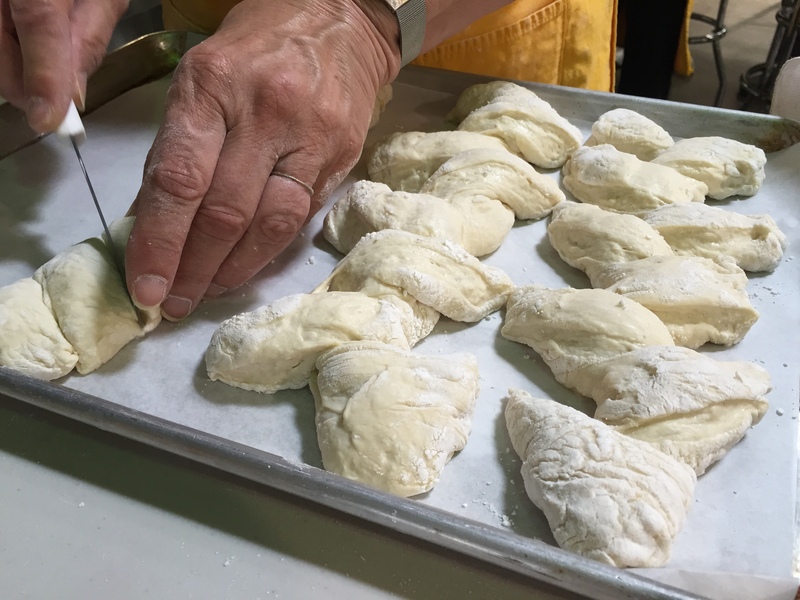 Now, gently stretch the dough and fold it in third, then in third again, like you’re folding a letter. Repeat, this time starting with the bottom edge closest to you. Return the dough to the greased bowl, with seam side facing down and let it sit for another 45 minutes covered in plastic wrap. 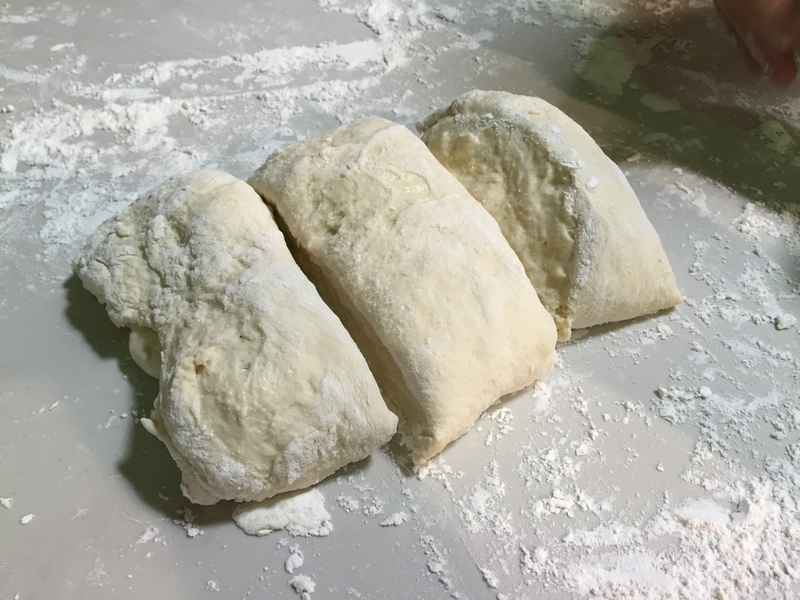 Place the dough in a floured surface and divide it into four equal portions (sorry, you only see three here). It’s best to use the scale to create an even portion. Gently pat down each dough to remove any large gas bubbles. 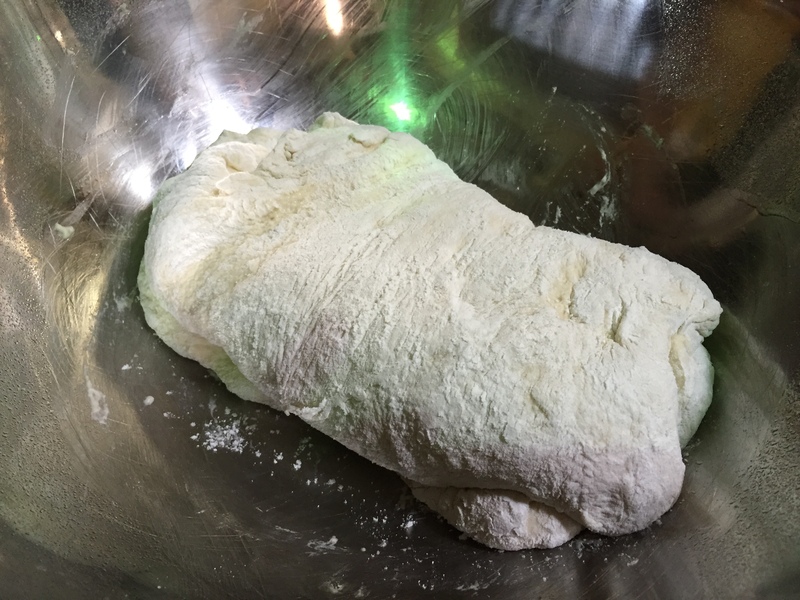 Place the dough log on a linen dish towel, with seam side down. Lightly cover the log with plastic wrap or the towel and let them rest for 20 minutes. I wish I can paraphrase it to make a simpler explanation but I’m not even going to attempt. Now, place the baguettes onto a baking pan. 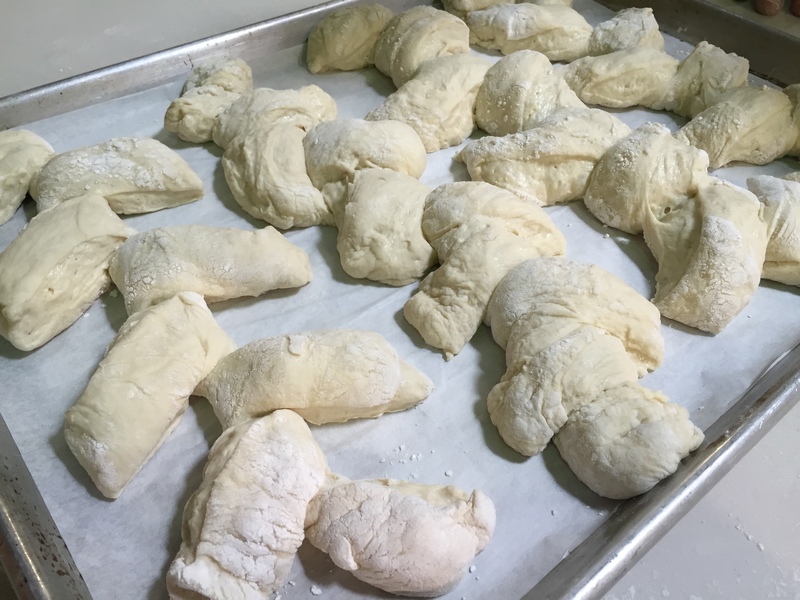 To create the Epi design, make a 3/4 cut through the baguette at a 30 degree angle and turn each piece of dough to alternating sides. Place pan filled with water on the bottom of the oven and bake for 20-25 minutes, or until the baguettes become golden brown. Let them cool to room temperature before serving. Aaah, look at these beauties! The freshly baked Pain de Epi was absolutely incredible. First came the Smile Biscuits, then the Sesame Sticks, and now, the Onion Muffins! I can’t tell you how much I’m enjoying the “everyday” cookbook series by Shiho Nakashima. They’re definitely two of my favorite book purchases of 2014. 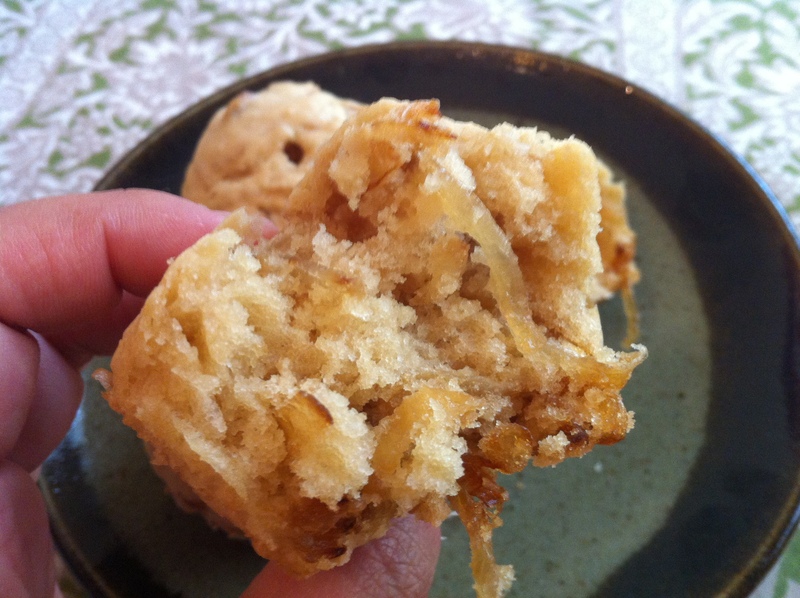 The Onion Muffin recipe is in the book, “Mainichi (everyday) Tabetai (want to eat) Gohanno (meal) Youna (like) Keiki (cake) To (and) Maffin (muffin) no (of) Hon (book) まいにち食べたい”ごはんのような”ケーキとマフィンの本.” Instead of cookies and biscuits, this book focuses on cakes and muffins. 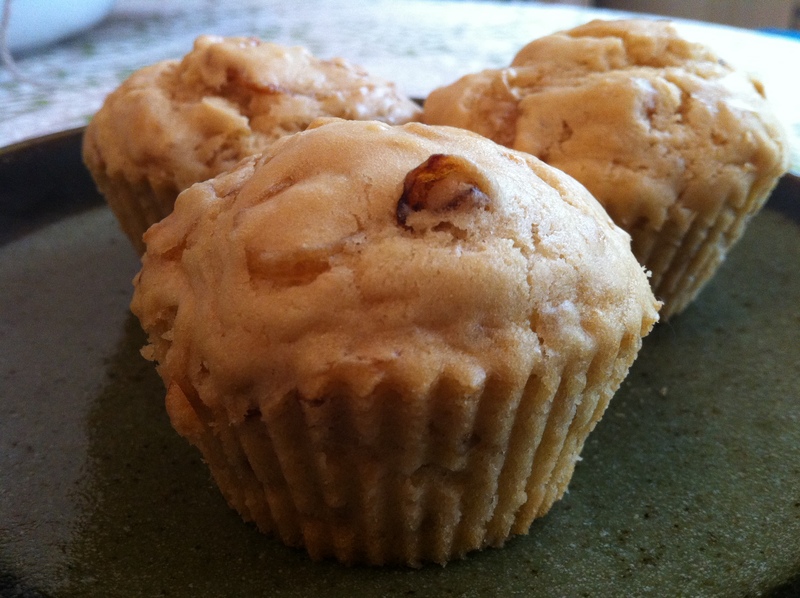 So, savory caramelized onion in sweet muffins, you might ask? I was a little confused at first too, and even more confused that the author named this as her “basic” recipe. I would think the basic would be something like blueberry or chocolate chips, but she wrote that she chose this particular recipe because it just tastes fantastic. I guess that’s a good enough reason! I must admit that I didn’t love the muffins. I liked the lovely balance of sweet and savory, and they were actually delicious (and fluffy, considering there’s no eggs in them), but they tasted more like cornbread than a muffin. I think I might like to serve these on a side of soup or salad, and not necessarily eat them as dessert with a cup of tea. There is a kid’s cartoon character in Japan called “Anpanman,” translated in English as “Bean Bun Boy.” He’s a superhero version of a popular Japanese confection anpan — a sweet bread roll (pan) filled with red bean paste (an) — dressed in a dandy cape. He helps the needy by letting them eat a part of his head (don’t worry, the new head is subsequently replaced by his creator and baker, Uncle Jam). His friends are Currypanman (curry bread man) and Shokupanman (white bread man), and his enemy is Baikinman (bacteria man). I once heard that many Japanese baby’s first word is not “mama” or “papa” but is “anpanman,” because kids respond to all things round, like Anpanman’s perfectly circular face. I’m not too certain how scientific that study is, but I can totally believe it. Go up to any kid in Japan and show them the picture — they’ll definitely know who he is. I’m excited to find out what Pon Pon’s first word would be. I hope it’ll be mommy or daddy, but I wouldn’t be too surprised if it’s food related, considering who her parents are. I tried making this popular Japanese sweet from scratch the other day, by making the bread and red bean paste at home. I must admit that the baking universe is extremely complicated and often humbling. The moment you think you’ve got the hang of it, the yeast God drops you down to earth and make you modest. My anpan came out a-okay but certainly didn’t have the light fluffiness and the golden surface that make this confection so special. Mine came out pretty dense and flat, and totally pale. I don’t know what I’m doing wrong here (my other bread attempt came out pale as well ) but it never comes out the way I like. It’s not that my bar is high – it’s just that bread-making is a complex art that takes years to master — and I’m still a complete rookie. But I think that’s why I’m so intrigued by it. You can find the recipe for Anpan bread from Runnyrunny999’s Youtube video! My breads didn’t come out perfect, but his did on the video so the recipe must be good! I won’t re-post the recipe, but here’s the recipe for the homemade red bean paste instead! Note: What you see in the following pictures are for a larger batch. I tripled the below recipe so I can freeze the rest and use it later. If you’re not a crazy anko lover like me, the single portion should suffice your sweet tooth. Put the azuki beans in a large saucepan or pot and cover with water. Bring the pot to boil in high heat, then reduce it to medium-low heat and simmer for 5 minutes. Dump the water using a mesh colander. Return the beans to the pot and add enough water to cover. Bring the pot to boil again in high heat, then reduce it to medium heat and simmer for 5 minutes. Repeat this one more time. Drain the water, reduce the heat to medium-low, and add in ½ batch of sugar. Stir constantly until the sugar melts. Add the remainder of the sugar and stir. Add a pinch of salt. Be careful not to burn the beans (or yourself, as the beans are piping hot from sugar). After the beans soften, turn off the heat and let it cool completely. Optional: After the beans cooled, I mushed the beans using a hand-held blender. If you like anko strained with no lumps (koshian), blend completely. I like mine with some texture left (tsubuan) so I left half of the beans unmushed. Make anko balls by taking a small amount and rolling it in your hands. Make eight anko balls to be used for anpan. I froze the rest of the balls, along with the leftover anko in a freezer, for future use. During our first few weeks of parenthood, many veteran moms and dads reminded us that tough times will eventually pass, and we’ll be rewarded with better days in the near future. My husband and I trusted those words and kept our eyes on the prize … and after many stressful days and sleepless nights, I think the day has finally arrived! I’m not sure if it’s because Pon Pon is a lot more low maintenance now that she’s 3.5 months old, or we parents have gotten used the routine (or maybe it’s a combination of many things, like not sweating the small stuff anymore), but our days are much more manageable now. The baby sleeps through the night (she goes to sleep at 8:00 p.m. and doesn’t wake up until 6:00 a.m. on most days), she’s happy during the day, and she’s just so fun to be around. And when she smiles … oh my, those giggles make all those early struggles worth it. I know that there will be many more sleepless nights to be had, but all in all, we’re in a really good, blissful place. My kitchen mojo has returned as well. It has become somewhat of a routine for me to go into the kitchen in the morning a few times a week and bake, before the baby wakes up. I’d turn on Today’s Show, say hello to Matt Lauer, and start mixing. I wouldn’t make anything too intricate or time consuming — just something that I can whip up in less than 30 minutes – but I really look forward to this quiet, tranquil “me” time in the morning. Today’s sweet – Azuki (red bean) mushi (steamed) pan (bun). I posted a similar recipe before, but I think it’s worth repeating! ① Measure and mix the dry ingredients in a bowl. Add milk and azuki and mix, just enough to incorporate all ingredients. Be careful not to over mix. ② Divide and pour the mixture into 5 cupcake linings. Steam over high heat for about 15 minutes, or until inserted toothpick comes out clean. ➂ Cool the buns on a baking rack for a few minutes before serving. Don’t worry if you don’t have a steamer at home. Simply use a large saucepan with a lid and put a steel colander basket that you use to wash vegetables with inside. Don’t over mix the dough. It really makes a difference in the fluffiness of the buns. 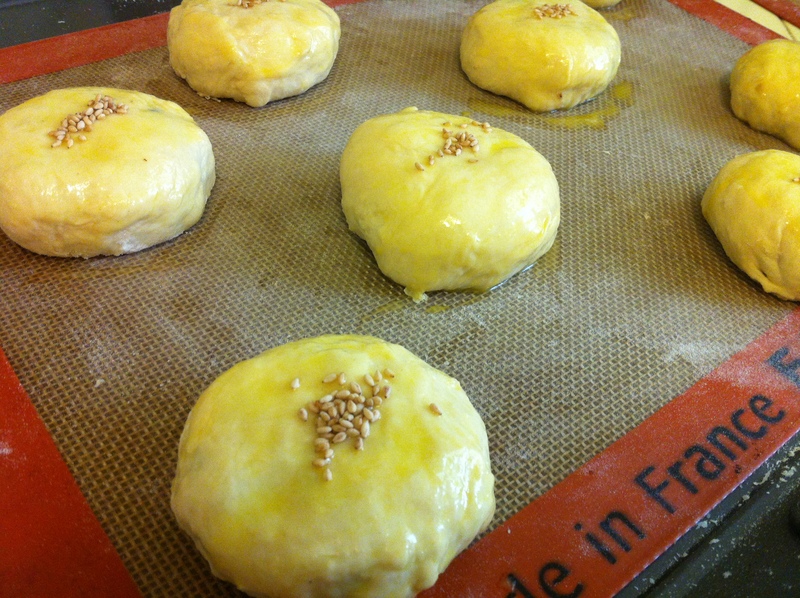 Don’t steam the buns too long and make sure that your steamer is really hot before putting the buns in. If you put too much water, the buns will become wet and sticky. These little fluffy buns are one of my favorite Japanese snacks. I like them so much better than cupcakes and have less calories since there are no oil or butter used here. The combination of airy bun and sweet aduki beans are exquisite. I’m going to try making the green tea flavor next time. I’m realizing every day how important it is to maintain a good balance in life. Although the baby’s well-being is our upmost priority (and will continue to be), it’s still very crucial to put aside some quality time for myself … and that’s not being selfish. On a contrary, that’s what’s best for the baby too. Happy mom equals a happy baby. A delicious variation of this confection is a green tea mushi pan. Simply add 2 tablespoons of matcha green tea powder with dry ingredients. They’re seriously good.